Navigating The Beverage Aisle! : AquaBall is a must-buy! You are here: Home / Featured Products of the Week / Navigating The Beverage Aisle! Navigating The Beverage Aisle! AquaBall is a must-buy! To help make your next grocery trip a healthier one, follow these beverage aisle tips to decrease the risk of obesity, diabetes, and more! Don’t get swayed by healthy sounding messaging on the front on the package, check the back for nutrition facts. Many times products will use words like “natural” and “organic” to disguise the nutrition contents (or lack thereof). Remember, just because a product is organic, does not mean it isn’t loaded with sugar. The American Heart Association (AHA) recommends no more than 5 teaspoons of added sugar per day. The scary truth is that the average added sugar intake for a 4-8 year old is about 21 teaspoons per day; quadruple the recommended amount. corn syrup, corn syrup solids, dextrose, fructose, high-fructose corn syrup (HFCS), honey, invert sugar, lactose, malt syrup, maltose, nectars (e.g., peach nectar, pear nectar, sucrose, and more. Thank you to our friends at AquaBall for sharing this info with us! 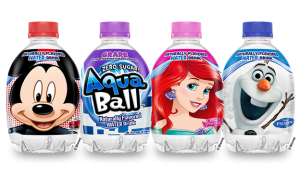 We are big fans of AquaBall and received samples and they are a real hit with our family! Self Disclosure: I have received free samples in the past and often feature AquaBall.